» Pre-MoFo kickoff: Christy Robinson review/giveaway! Don’t Eat Off The Sidewalk! Pre-MoFo kickoff: Christy Robinson review/giveaway! You may have noticed a few vegan bloggers posting about being contacted by Vegan Cuts to review products – I was one of them (thanks Melisser!). I was very excited when I learned I would be receiving some jewelry from Christy Robinson. Despite my foul mouth, when it comes to wearing vegan message items – t-shirts, buttons, etc., I don’t like wearing anything with a confrontational message. 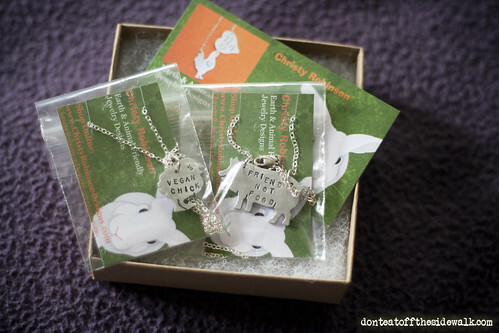 I already knew that Christy’s jewelry was the posi message kind, so right up my alley. 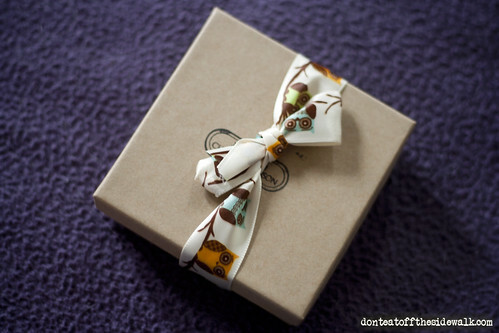 Obviously what it comes in doesn’t change the contents of a box, but opening a shipping envelope and seeing that someone took the time to wrap your stuff in a cute little bow makes the package getting more exciting. It’s the little details, guys. Inside I found not one, but two cute little necklaces! I don’t know how in depth one can really review a necklace, but if you like things that are cute and simple, you will like these. If you are shy about wearing any kind of vegan message, she has eco-centric jewelry, spay and neuter pieces, and ones like ‘I heart kale’. If you’re in the mood for something seasonal, check out the cute bat necklace! In addition to the necklaces themselves being made out of recycled materials, so are the boxes and even the baggie is biodegradable! Despite what is surely more expensive packaging than other people would use, you can get one of Christy’s pieces for as little as $16, and most of the standard necklaces are $20. 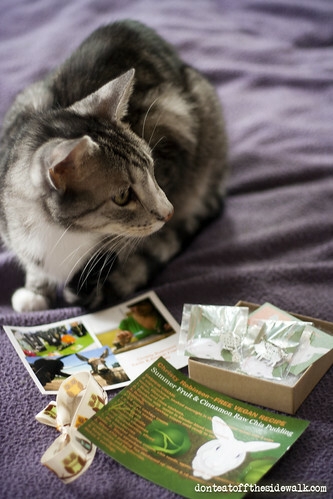 And like most people, I can’t open mail without my cats wanting to investigate the contents, so here is Gozer with everything I got, including a recipe card! I don’t know if I was expected to give one of the necklaces away, but since I got two I thought it only seemed right to share. So i’m going to give one away, and i’ll let you pick! I’m doing dinner and a movie for my VeganMoFo theme again, but not just horror movies. So to enter, just leave a comment saying which movie you would like to see a menu for! If it’s realistic I might make it happen (don’t say The Human Centipede). You don’t have to follow me on twitter or anything else. I’ll pick a winner on Sunday, October 7th. An finally, if you mosey on over to Vegan Cuts any time this month, you can get 10% off with the code ‘BLOGFRIEND’.